About 25 species, widely distributed in temperate and tropical regions. Type"species: Peramium repens (L.) Salisb. Spike 1-sided or loosely spiral; lip elongated. Margin of the lip recurved or flaring. Anther blunt; beak of stigma shorter than the body. 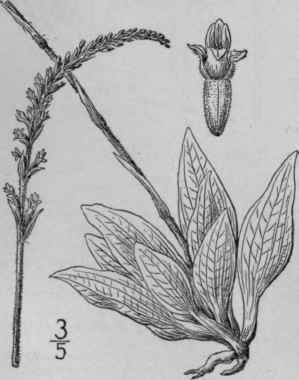 Anther acuminate; beak of stigma as long as body or longer. Margin of the lip involute. Spike dense, cylindric; lip short-tipped. 1: 6. 1899. P. ophioides Rydb. in Britton, Man. 302. 1901. Epipactis repens ophioides A. A. Eaton, Proc. Biol. Soc. Wash. 21: 65. 1908. Scape 5 -10 high, glandular-pubescent, bearing several small scales. Leaves ovate, the blade 6"-15" long, 4"-8" wide, somewhat reticulated or blotched with white, tapering into a sheathing petiole; spike short, i-sided; flowers greenish white; perianth 1 3/4"-2" long; galea concave, ovate, with a short spreading or slightly recurved tip; lip saccate, with a narrow recurved or spreading apex; column very short; anther 2-celled; pollinia not prolonged into a caudicle. In woods, Newfoundland to Yukon, South Carolina, Michigan and Colorado. Ascends to 5000 ft. in Virginia. Creeping-root plant. White-plantain. Squirrel-ear. 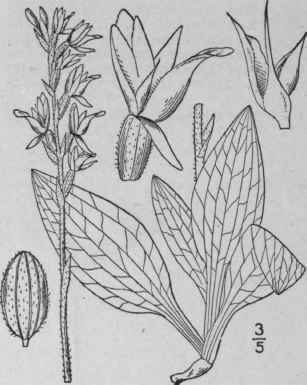 P. repens (L.) Salisb. 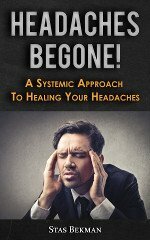 is restricted to Europe and Asia. July-Aug.
Goodyera tesselata Lodd. Bot. Cab. 10: pl. 952. 1824. Epipactis tesselata A. A. Eaton, Proc. Biol. Soc. Wash. 21: 66. 1908. P. tesselatum Heller, Cat. N. A. PI. Ed. 2, 4. 1900. Scape 6'-12' high, glandular-pubescent, scaly. Leaves ovate, oblong-ovate or ovate-lanceolate, the blade 10"-20" long, 4"-11" wide, bright green, more or less conspicuously marked with white, usually abruptly narrowed into the sheathing petiole; spike 1 1/2-5' long, loosely spiral; flowers whitish, larger than those of P. ophioides; perianth 2"-2 1/2" long; galea broad, the tip recurved; lip slightly saccate at the base, the long tip somewhat recurved; column short. Mostly in coniferous woods, Newfoundland to Ontario, Pennsylvania and Michigan. July-Sept.
Spiranthes decipiens Hook. Fl. Bor. Am. 2: 203. 1839. Goodyera Menziesii Lindl. Gen. & Sp. Orch. 492. 1840. P. Menziesii Morong, Mem. Torr. Club 5: 124. 208. 1906. Epipactis decipiens Ames, Orchidaceae 2: 261. Scape stout, 8'-15' high, glandular-pubescent. Leaves ovate-lanceolate, 1 1/2'-2. 1/2' long, 8"-15" wide, the blade acute at both ends, often without white blotches or reticulations; spike not 1-sided; flowers greenish white; perianth 4"-4 1/2' long; galea concave, ovate-lanceolate, the tip long, usually recurved, lip swollen at the base, with a long narrow recurved or spreading apex; anther ovate, pointed, on the base of the column, which is prolonged above the stigma into a gland-bearing awl-shaped beak. In woods, Quebec to British Columbia, New Hampshire, Michigan, Arizona and California. Aug.
5: 198. 1813. 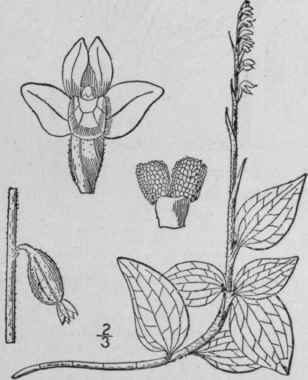 Peramium pubescens MacM. Met. Minn. 172. 1892. Epipactis pubescens A. A. Eaton, Proc. Biol. Soc. Scape 6'-2o' high, densely glandular-pubescent, bearing 5-10 lanceolate scales. Leaves 1'-2' long, 8"-1' wide, strongly white-reticulated, oval or ovate; spike not 1-sided; flowers greenish white; perianth 2V-3" long; lateral sepals ovate; galea ovate, its short tip usually not recurved; lip strongly saccate with a short broad obtuse recurved or spreading tip. In dry woods, Maine to Ontario and Minnesota, south to Florida and Tennessee. Ascends to 4000 ft. in North Carolina. Adder's-violet. Net-leaf or spotted-plantain. Rattlesnake-leaf. Rattlesnake- or scrofula-weed. Ratsbane. July-Aug.